It’s interesting how often Woo pauses, especially in the third act, to celebrate the homosocial bonds the Code builds, on both sides of the law. Both the Killer and the Cop have strong and intense relationships with their partners; the Cop even weeps loudly when his partner dies, an outpouring of emotion dramatized not as a fault in his masculinity, but an example of his commitment and dedication to his friendship forged by the Code. Through mutual respect, a similar friendship develops in the scene where the Killer has bullets removed from his back. This scene is an echo of an early moment in the church, where the Killer’s pain is cast as a lonely, celestial experience, witnessed only by unblinking stone statues. In the second instance, it’s a consummation of terrestrial friendship. Adhering by The Code is the only principle that matters in the world of the film, the only complete connection in life. The arc of the Killer’s friend, similar to that of the lone white male character in John Ford’s 7 Women, shows the absolution these connections can bring. His death is a redemption, a celebration of his loyalty, morality and righteousness, his final acceptance into the brotherhood of The Code. The Killer also abounds with references and stylistic homages, conscious or unconscious, to other examples of the cinema of The Code. In the subtitled version I watched, the Killer was given the name “Jeff,” like the honorable assassin in Jean-Pierre Melville’s Le samurai. As Jeff Costello, Alain Delon exudes a detached cool, sharpening his spartan life into the perfect expression of the Code. 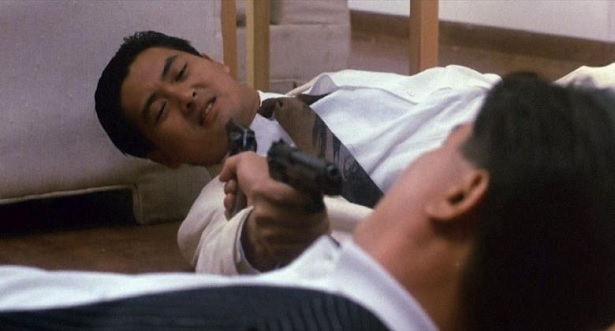 While Chow Yun-Fat is a much warmer presence, he exhibits a bemused placidity that is perfect for his role in this film. Le samurai was itself a reinterpretation of earlier American genre pictures (via a Japanese ideal), and this telephone game of generic influences across the world fascinates me. For example, Seven Samurai is deeply influenced by Westerns, and was itself turned into a Western with The Magnificent Seven. In fact, the Western is an apt comparison, because it provides another milieux where an ethic of strength, stoicism and honor abounds. Here, the Killer plays a plaintive harmonica and will never shoot a man in the back. Perhaps the importance of The Code in The Killer is nothing more than tired cliches or postmodern hypertextuality. Still, the sincerity of Woo’s style and the way this theme slowly begins to overtake the plot make it hard to dismiss.